From solo founders to Fortune 500 companies, Doorbell.io is perfectly suited for side projects or websites and apps of huge scale. Great product but for me the customer service make it! Pros: I like the ease of use of this product and the speed at which doorbell take feedback and makes changes to their product. Overall: We had a problem where we had multiple team using doorbell and paying for this on a monthly basis by each teams credit card which is a financial nightmare. 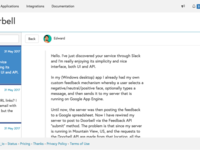 The support team at doorbell worked with us to create an enterprise agreement and solution. This not only allowed us to centrally manage costs but we are also able to centrally manage our user base and access controls. 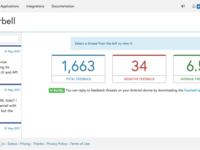 The support team is very open to feedback about the product and is very quick at turning around enterprise benefits such as encryption at rest, enterprise agreements, 2FA and consolidated user management to name a few. Pros: It's very intuitive, easy to set up, and does everything it should. 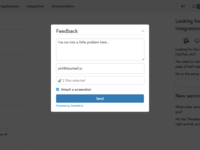 Not only can users submit a textual feedback but also attach a screenshot, as well as some relevant debug data like operating system used, web browser, screen resolution, and more. And - that's also very important - the founder of Doorbell, provides great support. Over the last several years, he acted on all bug reports super fast, as well as implemented most reasonable feature requests. Cons: Maybe being able to merge two separate feedback threads into one thread? And as I know the founder of Doorbell, this feature is likely to get implemented in no time... So this "con" will probably turn into a "pro" soon. Overall: As a website visitor, user or a customer, being able to provide a feedback or problem report with a single click is super important. This provides valuable "intel" to any business owner. We've been super happy with Doorbell for several years now. Overall: Doorbell has been a great addition to our way of working - both during development, and after websites go live. Clients respond very positively to having a support mechanism built directly in to their website, and we love not having to interrogate them for basic details before we can investigate and fix issues. I can't imagine being without Doorbell now! Pros: Quality of SDK and speed of integration into our apps. Also this platform is great at one thing - it hasn't tried to become a marketing automation tool and more, becoming bloated. It's awesome for customer comms and feedback. Cons: Nothing really. It does what it says on the tin for an extremely good price. Overall: Doorbell has helped us understand our customers' perception of our apps and move them forward in line with customer desire. Pros: The setup is simple and fast. The back-office is rich and handles efficiently multi-applications and multi-accounts with a nifty request tracking system. Since 2 years now that we are using Doorbell.io, the service got many updates bringing in more productivity each time. The support team is very responsive. Cons: The submission form is limited to what is needed for the "feedback" use case. Which is fine except if you meet other use cases where more input fields/types are needed. We look forward to see Doorbell extend the range of possible usages. Pros: First is was the easy of installation, second the depth of customisation and third the continuous upgrades and integrations with other apps. Overall: The main problem that Doorbell solved , is that my users can easily now send me feedback about my product in a minute and give me the opportunity to improve them.